How do you spend Easter Monday? The day is among those holidays observed by Amish. Here in heavily-Catholic Poland the Poles pack the churches. Right now I’m in Warsaw at my grandmother’s, waiting for family to arrive. We’ll have ten people filling the apartment for the traditional meal. My grandmother has gotten more creative in recent years and incorporated turkey with peach halves into the menu. I’ve been smelling and eyeballing that since I woke up. The Easter bunny has, for the most part, not burrowed his way into Polish culture (but with the growing popularity of western traditions such as Halloween and Valentine’s Day, it may just be a matter of time). Easter egg hunts and egg rolls are not found much here either. However, Poles do decorate eggs in a variety of ways resulting in elaborate and beautiful designs. There is a tradition of scratching or etching the surface of the egg as well as tracing designs into an egg dipped in wax. 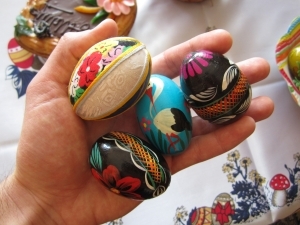 Painted and carved wooden eggs are also part of the tradition. I took a photo of some of the eggs on our table here. There is also the custom of śmigus-dyngus, aka “Lany Poniedzialek” (Wet Monday). On Wet Monday you have free license to douse passersby with water, though it’s typically young boys soaking girls. If you get splashed, it traditionally means someone likes you. It can also simply turn into a full-fledged waterfight. The tradition is popular in villages, but even here in the capital you’ll see footage of water flying on the evening news. Luckily for anyone who gets wet, the sun is shining powerfully today. Yesterday it was snowing. We don’t really do much on Easter Monday; for me it’s another work day. Friday and yesterday(Easter Sunday) were the holidays. Yesterday we went to church and visited friends and family afterward. Couldn’t quite make sunrise service, so we went at the usual time to the new church planted in Yanceyville NC. Did not know you had planted a new church in Yanceyville Forest, hope that is going well for you. Pysanky! No, I don’t know how to make them, yet. Although none of us is Ukrainian, we did have a Ukrainian Paschal feast, and celebrated the festal eucharist at home. (All three of us being ordained, we do that.) We used the old Anglican rite rather than a long Orthodox rite. So all of my American and Canadian friends can be envious – we had pickled herring, borscht, stroganoff, pierogies and honey-spice cake with whipped cream. And lots of smetana – sour cream. With dark beer and red wine, and we are all groggy this morning. We had a blizzard followed by freezing rain. Lovely subarctic spring weather. Exactly, pisanki (Polish spelling a little different from the Ukrainian transliteration…). I know the tradition is big in Ukraine as well. Some of them are quite beautiful. In Sweden we have Påsk afton(Easter eve),Saturday, Påsk dagen (Easter day) Sunday and Annandag Påsk, (“second Day Easter”) Monday. Three days of some kind of Easter celebration. Saturday is more of a family get together day and a day when there is fun stuff for the kids to do and Sunday is for church. We do the same for Christmas and it is great. You really have time to let the holiday sink in. Kind of miss that living over here. Very interesting Anna. Just curious, in Sweden do a lot of people go to church on Easter who normally wouldn’t? Not as many as on Christmas but a few more than the regulars shows up. Nothing like over here though. Easter Monday is also just another work day for me. I sure wish it were otherwise! It’s sunny, but very windy, and only in the 50’s, so there’s a chill in the air. In high school (all-girl, Catholic, taught by nuns) my art teacher, Sister Jolanta, would have those Ukranian eggs in the works for weeks before Easter, melting wax and applying it to boiled eggs using a special little “funnel”-type metal device, then dipping the egg in dye, then burning off the wax over a candle, then re-applying wax in a different area, dipping in dye, burning off the wax, over & over. It was certainly time consuming, but the results were beautiful. In my own family, my mother had her own tradition of hand-painting (with watercolors, her favorite medium)boiled eggs, usually in her favorite theme of “little cabin in the woods”. In later years, she painted a few other scenes, specially for me—I still have a couple, and she’s been dead for about 34 years. People “ordered” them, and sometimes she’d have a couple dozen going at a time, in different stages of production. I sure wouldn’t mind sampling your Grandma’s meal, Erik! Does she have any recipes she’d be willing to share? So—do the Amish treat this as another Sunday (no work), or what? I’m curious! Alice Mary, am I imagining things or did you mention pisanki on another post recently? I will see if I can finagle the recipe out of g-ma and translate to English…it also comes equipped with a pretty mean peach cream sauce. Also “dietetyczny” of course. Nope, no mention of pisanki from me, but I believe others have mentioned it. Heck, I’d like any recipe (the simpler, the better, actually) from your grandma, as my grandmas have been gone since 1958 & 1960. (One from Poland, one from Germany). Give your Grandma a hug from me, too! Here in Buffalo, NY there is a large Polish community. Dyngus day is widely celebrated by Polish and non-Polish alike. Lots of celebrations all over the city! People take the day off to celebrate. Happy Dyngus Day, Erik! I have always wondered why you live in Poland. Are you originally from Poland since Grandmother is there with you? Both my parents are from Poland Theresa, mom directly and dad in a roundabout way…I visited as a kid in the 80s and 90s and liked it a lot. After graduating from U, I came for a year and have kept coming back (with a lot of time in the US though, so I don’t know exactly where I do live 🙂 ). Now I like the thought of a waterfight! My friend from Gdansk said they usually used little squirt guns to get the girls on the way to Church. Hope everyone had a nice and blessed Easter. Those are really beautiful eggs, Erik! And also the cloth on the table is really pretty, too. We don’t do anything special on Easter Monday, and infact most had to go back to work and school. But on Easter Sunday my husband and I went to church in the morning and then most of my family ( about 15 ) came to our house in the afternoon for Easter dinner. Enjoy your stay in Warsaw Erik. If others get a trip to Poland, be sure to visit the famous Salt Mine with wonderful sculptures out of salt. There is a large ballroom that is fantastic. To the other extreme, a visit to Auschwitz Concentration Camp is a must. It is something we must never forget so that it will never happen again. Thanks Bob, you are right on all counts. I visited the first two in 1989 and as for the Old Town I just spent a couple hours Monday walking around it, as I usually do when visiting Grandma. It is a pretty amazing rebuild. Are Amish Shops Open on Ascension Day?